Former Vice President Al Gore said the notable earmarks of recent storms — like the quick intensification of Hurricane Michael this week and the heavy rainfall of Hurricane Harvey last year — support the findings from an alarming, new U.N. report that said if the world didn’t drastically reduce its carbon emissions, the consequences will become dire sooner than expected. “We have a global emergency,” Gore told the PBS NewsHour’s Judy Woodruff in a wide-ranging interview Friday. The report, authored by more than 90 experts from dozens of countries, said the consequences — low-lying areas flooded from rising sea levels, intensified storms and wildfires, food shortages, mass die-offs of coral reefs, among other threats to billions of lives around the world — could become much more acute as early as 2040. The task of lowering emissions is “not impossible, but will require unprecedented changes,” U.N. panel chief Hoesung Lee said earlier this week. “The scientists not only predicted these consequences, they’re telling us they’re going to get a lot worse still, until we stop using the Earth’s atmosphere as an open sewer,” Gore said. Gore said the scientists behind the U.N. report “torqued up” their warning, in the hopes of getting the attention of policymakers worldwide. 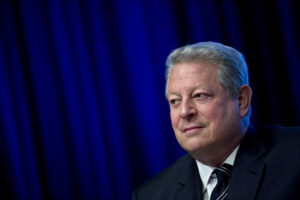 Gore shared his 2007 Nobel Peace Prize with the Intergovernmental Panel on Climate Change, the group who put together the U.N. report, for drawing attention to the issue of man-made climate change. The Trump administration’s response to the U.N. report, however, has been muted. Despite the scientists’ extremely strong calls for expedient change, there wasn’t an immediate response from President Donald Trump. “I can give you reports that are fabulous and I can give you reports that aren’t so good,” he told reporters this week. The Trump administration has said it will focus on the economy and roll back environmental regulations it thinks are hurting the U.S. economy. The president in 2017 pulled the U.S. out of the Paris climate accord, a landmark agreement unprecedented in its global reach to limit carbon emissions, which is contributing to global warming. Trailing China, the U.S. is the second-largest emitter of global CO2 emissions, according to data from the Environmental Protection Agency. Trump did say he would review the report, but added that he wanted to see which group drafted it. On Trump stirring up his base by attacking Democrats ahead of the 2018 midterm elections: Following Justice Brett Kavanaugh’s swearing in to the Supreme Court, the president tried to rally his supporters over the judge’s contentious confirmation process by calling Democrats an “angry mob.” On whether this is an effective tactic for Trump to deploy, Gore said his personal impression is that there are tens of millions of Americans who wanted to “take a chance” on voting in Trump, but are now “a little bit heartsick that he has been acting out every day telling falsehoods almost as easily as he breathes. “I think a lot of Republicans and independents, as well as Democrats, are kind of quietly itching for the opportunity to go the polls and send a message to President Trump to calm down. don’t be so crazy,” Gore said. Watch the full interview with Gore tonight on the PBS NewsHour.